Administrative technology is the broad group that makes new government types available, increases production efficiency, unlocks national idea slots, and enables the construction of a wide range of different buildings, most of which are related to issues of stability and income. Higher levels also provide more administrative efficiency for your country, which means less coring costs and less aggressive expansion impacts but also higher liberty desire in colonial nation subjects. Most formable nations require Administrative technology level 10 to form. Diplomatic technology is primarily related to interactions with other nations and far off lands. This research area increases trade efficiency, colonization range, diplomatic influence, and naval power. The buildings that diplomatic technology allows are trade and sea related. Military technology focuses on improving the performance of land forces and provides access to new troop types, increases the morale, maneuver and tactics of armies, and allows construction of buildings associated with warfare, including recruitment centers and fortresses. This image may contain outdated information that is inaccurate for the current version of the game. The last version it was verified as up to date for was 1.24. Each country belongs to a technology group, which determines the initial starting level of technology and in general terms how much of the map is discovered at the beginning of the game. Each group has a unique list of land unit types representing the general military strategy of similar countries. The unit list also determines the maximum ratio of cavalry as a proportion of an army (excluding artillery) that can be fielded without suffering the insufficient support penalty. Almost all countries in a given tech group begin the game either embracing the institution of feudalism or not (exceptions to this rule are listed below). Those that don't therefore start with a 50% penalty to technology cost due to institutions. Those that do embrace it have no such penalty, until the Renaissance starts shortly after 1450. All countries in a given tech group begin the game with their given tech level, regardless of whether or not that country begins with a tech penalty that deviates from the standard institution penalty of their given tech group. For more information, see Institutions. + Only exists if  playing a CK2 converted game where Sunset Invasion DLC was activated (replaces the usual tech group for some Native American empires),  fantasy content was enabled for a Random New World with the Conquest of Paradise DLC, or  playing a custom nation created with the nation designer with the El Dorado DLC. Primitive nations get reduced income from gold and cannot build ships, preventing them from colonizing non-adjacent provinces and removing the penalty to sieging their coastal forts without a blockade. Colonial nations may attack primitives, and vice versa, without involving the mother country. They also do not cause separatism in conquered provinces if the conqueror is not primitive. An army led by a conquistador can move through the land of primitives without need for access. Nations with a primitive technology group can shrug off the label of "primitive" (giving them full gold income and ships, etc.) by reforming their government (for nations in the North and South American technology groups) or religion (for natives in the Mesoamerican and Andean technology groups). After reforming government and religion, an Administrative Technology of 8, and a stability of at least 2 is needed to pass the decision "Reform Society". The cost for researching a new technology level consists of the base cost, 600 monarch points, multiplied by the current institution penalty and all modifiers, plus 100%. There are seven world-changing ideas that spread throughout the world over the course of history. Societies that haven't embraced these ideas will have a harder time keeping up in technology as the rest of the world, especially Europe where these ideas usually originate, outpaces them. 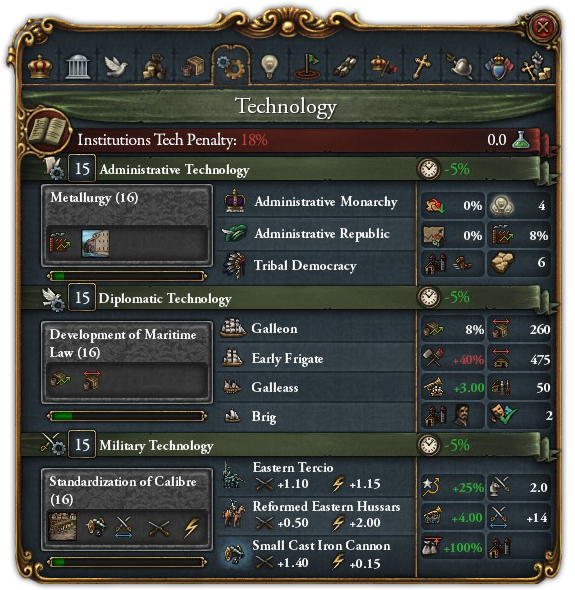 Each institution that has appeared but hasn't yet been embraced by the country causes a +1% penalty to technology cost for each year that has passed since the institution's appearance (to a maximum of +50%), and a corresponding bonus to the maximum number of stockpiled monarch points. These penalties accumulate as additional institutions appear; at the extreme, a country that still hasn't embraced any institution in 1821 will have a +350% penalty to technology cost. General modifiers reduce the cost of all technology types. Technology cost increases over time. This increase is linear and only depends on the historic discovery date of the current technology of a country. This means if the historic discovery date of the current technology is 1444 the increase is 0% and if the historic discovery date of the current technology is 1821 the increase is 30%. A country will get a -5% (up to a maximum of -75%) to technology cost for each level in a technology type it is behind the most advanced nation either bordering the country with a land connection to its own capital or in the same technology group as the country. This means that a Chinese or Indian nation will see a benefit merely from bordering a Western nation when the border connects via land to its capital, but a less-advanced Western nation will not be helped more by expanding to the borders of a highly advanced one (as it gains the bonus through technology group). Once you have Study Technology (Diplomacy 9), the cost of a technology is reduced if you have a spy network in a nation that has that technology. Type specific modifiers reduce only the cost of one technology type. In addition there are many decisions, events and missions that influence technology cost (general or type specific). A country is ahead of time in a technology type if the game year is earlier than the historic discovery date of the current technology. If a nation has a technology that is ahead of time, the technology cost for the next technology of this type is increased by 10% per year ahead. This can lead to a situation where if a certain technology is researched 10 years ahead of its time, then it wouldn't be possible to research the next technology in line (this is due to the monarch storage cap). Administrative technology only unlocks government types if the Dharma expansion is not active. With Dharma, the government reforms mechanic is used instead. 1350 The most basic unit of governance is an extended family where all members of a community claim kinship with each other, a tribe in other words. 1390 A family structure with most senior members at the top can work for nonrelated groups. In its simplest form, the system is meritocratic, with leadership tasks assigned to the most capable. 1420 As social organization improves, so do things like food production. Increasing food production allows a society to upkeep people who aren't producers of food themselves. This leads to creation of a military elite, to defend against enemy's military elite. Supporting of the military elite is the basis of the feudal system. 1440 With a military elite to govern our society, the next stage of development is to have a literate class of administrators. Usually these will be drawn from the ranks of clergy. 1453 Housing the machinery of government is as important as the machinery itself and one should never forget of the importance of religion when doing so. 1466 Choosing the direction a country is going to take is perhaps the toughest choice a ruler will ever face. National ideas are the concepts that will shape our country for years to come. 1479 Prior to the Industrial Revolution the Workshop- or Putting-out System was used in Early Modern Europe to organize the production of everything from Textiles to Wrought Iron. With materials provided craftsmen could refine various goods either in workshops or in their own home, bypassing the rigid restrictions of the guilds. 1492 The notion of a noble oligarchy ruling the society has existed, since well, at least the Roman times, and remained popular in some parts of the world. Now this idea is once more gaining popularity amongst those who matter. 1505 The problem with a hereditary local nobility is that they tend to value their local interests over those of the rest of the nation. We need to steadily expand the reach of the government, which begins with two of the most important areas of administration, justice and taxation. 1518 Although it has been in existence for a long time, the scythe somehow still isn't the most popular tool for harvesting crops. By encouraging peasants to use a scythe instead of a sickle we will improve the efficiency of our harvests. 1531 The development of the social structure is not exclusive to the aristocracy. The clergy too have to improve their internal governance. This will assist in the development of modern thought in our country. 1544 Textiles were manufactured since time immemorial. The invention of stocking frame in 1589 was the first step towards the industrial revolution and the beginning of mechanization. This invention would lead to increase in textile production. 1557 In time it became apparent that a more centralized bureaucracy with administrative bodies run by educated officials employed directly by the state was a necessity for the ambitious projects of the Early Modern rulers. 1570 The more land we can cultivate, the bigger the population we can feed in that area. Gradual improvements in drainage have led to wetlands being brought into use. 1583 While it is true that we stand on the shoulders of our ancestors it is high time that we start to learn about the world from our own, well documented observations. By observing the world around us and by experimenting to prove or disprove our ideas about it we can reach further than those before us. 1596 The ever increasing armies of the 16th century put bigger and harder demands on the administrative systems of states. By creating a permanent organization charged with taking care of the procuring and planning of Military supplies and by keeping more troops on the rolls even during wintertime or peacetime we will in the long run be able to field large armies more cheaply and be able to support these armies more efficiently while at war. 1609 The process to produce wrought iron was under continuous improvement and by the early 17th century the finery process came to overtake the older Osmond process. Iron production could now be specialized with the working of the iron no longer taking place at the same location as it was mined and more, stronger and purer iron would in time lead to developments in many other sectors. 1622 The great medieval universities were of course great but they were not able to produce enough graduates to staff our growing administration. We need to expand our universities or we will fall behind. 1635 The many and long wars of the first half of the 17th century have led to an international diplomatic system where the territorial integrity of states is a cornerstone. States rather than individual rulers or supra-national groupings are the actors on the international arena and no state has the right to intervene in the internal affairs of another. 1648 Promotion of religion will be crucial for the stability of the realm. It is not enough to be great, people must be able to see our greatness. The ancients knew how to display their greatness and we will do the same by building monuments to withstand the test of time. 1661 There are many people who demand to be given a role in the government, but in reality mostly want rewards without effort. A new interesting idea of absolutism is spreading, which is a system where we dispose of those parasites and govern alone. 1674 Large-scale woodlands are of course useful as a source of firewood and a place for hunting, but if the trees were to go, those lands could be used for farming instead. 1687 A new philosophical concept called constitutionalism has been developed, where the government accepts legal limits to its power. This is an intriguing idea, but I can't see it catching on. 1700 The new sciences have given us a number of different ways to describe and measure the world around us. Let us send these learned men out into the world in general and into our country in particular. We cannot know what resources are at our disposal until we have thoroughly searched all our lands for minerals, counted every last subject and assessed every last enterprise. 1715 Paying for the upkeep of the army, the navy and the administration itself accounts for the majority of the expenses for any state. As these are expenses that can run away quickly, however, taxes and tolls can be frustrating and inflexible ways to raise the money needed. While national debt is far from unheard of we need to come up with better plans for raising money. Bonds, tontines and other similar plans can be used both domestically and abroad to finance unforeseen expenses and will allow us to make much better use of the money we do have to develop our country. 1730 Having the technical means to improve land and thus production is useless without incentives to do so. By reforming the laws of land tenure we can provide greater incentives to adopt improved methods of production. 1745 An anonymous treatise on political theory has emerged, and despite efforts to suppress it it is quickly spreading across the world. It deals with the nature of forms of government, be they monarchies, despotisms, or democracies, and argues for a strict separation of the executive, legislative, and judiciary branches. This would protect the people and limit the power of a monarch, which is understandably a very popular prospect for many of our subjects. Despite the unfortunate implications for the power of monarchs, these ideas may well benefit our nation greatly. 1760 In order to make the most of the lands and subjects we control we must enlarge, reorganize and professionalize our bureaucracy. A robust organization can handle each part of our state and eliminate the need for ad hoc solutions. Let us put our universities at work to consider the best ways to efficiently rule and govern and let us encourage the sons of the nobility to serve the state with a pen in hand rather than a sword. 1775 The basic plow in use in Europe has been unchanged since the Roman times. Now, thanks to improvements in design, the same plough can be made much lighter, reducing workload on draft animals, allowing them to do more work. 1790 At the forefront of current revolutionary thought is the radical notion of equality for all. Philosophers from different parts of the world have worked together to create a document entitled the 'Declaration of the Rights of Man and of the Citizen', proclaiming that these rights are universal and should be enforced by law. It is likely that this will have ample repercussions for the development and spread of the concepts of freedom and democracy, and we would do well not to lag behind. 1805 Fortunately for us, the so-called enlightened philosophers didn't restrict themselves to writing subversive political treaties, but they also have come up with ideas in the areas of science and engineering. These are a boon to our economy and have led to an increase in production. 1820 These foolish revolutionaries think they can simply consign hundreds of years of progress to the dustbin of history, all in the name of such outlandish concepts as liberty and equality. We will defeat them through the tried and tested plan of stealing the bits and pieces of their ideas that we like. 1835 My secretary of state assures me that the switch to clover as a fodder crop and the addition of the turnip in a 'four field' rotation will increase yields in agriculture. I am inclined to promote this idea. 1350 Shipbuilding can mean a lot of different things, it is amazing how far you can get on a raft for example. However, this is not the same as creating a fleet to enforce policies of a state. This requires a whole different approach to the building of ships, as well as developing ways to control the navy you've built. 1390 The patterns of trade had been seriously disrupted in the 14th century, possibly due to plagues and pandemics. Now trade is slowly beginning to recover. 1420 The barque has a long history, beginning as an Ancient Egyptian river boat. However, since then the term has gradually come to mean a light ship. 1440 The first true ocean-going ship. Unlike galleys and cogs, Carracks can serve the role of proper ocean-going warships. 1453 Creation of legal and regional infrastructure in order to promote trade will not only encourage commerce but also allow us to better tax it. 1466 Overseas trade is very risky but also highly profitable. The development of financial instruments like letters of credit will help reduce the risk, increasing our profits. 1479 As time progressed an expanding and increasingly advanced shipbuilding sector put new demands on seaports. Well maintained and planned docks went from being a convenience to a necessity for any location wishing to become a centre for naval or maritime activity. 1492 With an extra boost to naval morale, our sailors will conquer the waves and rule the seas. While our colonists will be able to brave the dark corners of the world, founding new settlements farther from home than ever before. 1505 Land transportation of a lot of cargo is simply too expensive, moving it by ship is more efficient. Building shipyards will provide enough ships to do so. 1518 Development of the lateen sail allowed Carracks to sail much closer to the wind than earlier vessels. Enhanced maneuverability made them superior to other ships. 1531 A Flute is a specialized cargo vessel capable of carrying a large load with a very small crew. Flutes were designed to be built cheaply and in large numbers. A useful ship if you need to move things across the oceans. 1544 The great wharfs and jetties will act as entrepôts for the world's goods. Let us build them and prosperity will follow. 1557 Throughout the 16th century the increasing sailing ability of ships together with a growing number of more efficient guns have led to an increasing specialization of ship types. A Man of War is a ship dedicated entirely to sea warfare with a greater number of guns and ammunition than a ship that would also have to act as a Merchantman could ever hold. In the long run this development will lead to growing permanent navies and the development of naval tactics to better fit the new realities of sea warfare. 1570 The world is a big place and in order to develop our trade in it sometimes quite big risks must be taken. Luckily there are Merchants in our country that would be willing to do so, using mostly their own capital. By sanctioning such companies with a Government charter giving them special rights to exercise government powers as well as monopolies in certain areas we can control and encourage commercial development of everything from foreign trade contacts to our colonial possessions overseas. 1583 Galleys were light and small, and it was very difficult to mount cannons on them. The Galleass was a larger vessel capable of carrying a broadside of cannons like a man-of-war. To compensate for this extra weight, Galleass would be equipped with an additional sail. 1596 The Galleon was created by lowering the forecastle and elongating the hull. These changes in design improved the speed and stability of the ship. Which was of vital importance for Galleons to serve as better gun platforms. 1609 With more and more countries sending their subjects or citizens abroad on various trading ventures and with so many living so close to each other for so long times it has become absolutely essential to have at least a basic concept of common laws of the seas. With publications such as 'Mare Liberum' or the later 'De Dominio Maris Dissertatio' the foundations to an international law of the seas has been laid. 1622 Further development of transport ships led to construction of larger and faster vessels, which still tried to maintain the simplicity of construction of the Flute. These ships fell under the generic term Merchantman. 1635 In order to make better use of the various developments in naval warfare new tactics are required. The evolution of broadside cannon have meant that the most efficient way for ships is no longer to seek to board the other party but rather to form a line of battle to be able to maximize the amount of firepower directed at the enemy. 1648 The War Galleon, also known as a race-built Galleon, was built by reducing the number of decks on a Galleon. This sacrificed cannons for maneuverability, which proved to be beneficial in combat. 1661 Even at the beginning of the 17th century permanent navies were quite small and even naval powers of note would mostly maintain a naval force to meet their immediate needs. Over time however we are moving in the direction of a larger professional navy. Unless we want to see our rivals overtaking us in naval matters we must strive to create a larger permanent navy with an administrative structure to support it as well as ensure that a naval career can be a permanent occupation for our officers. 1674 Originally developed by Barbary Corsairs, this galley didn't carry as many guns as a galleass, but it was smaller and far more maneuverable. This improved maneuver allowed it to be far more effective in combat. The naval attrition is no longer increased by staying out at sea each month. 1687 In 1614 a rather mad physician wrote a treatise suggesting that scurvy was a result of a dietary problem and could be solved by consuming lemon or lime juice. As it turns out, there was method in his madness and we have started providing this new diet for our sailors. Other countries call us limey now. 1700 Original frigate design described any ship that was built for speed and maneuverability. As the concept developed though, it became its own unique class of a ship designed to support ships of the line. 1715 A special version of the Frigate originally developed for operation in the Baltic. It kept a broadside of a frigate, but had a shallow draft and oars giving greater maneuverability in shallow waters, while sacrificing seakeeping in open oceans. 1730 The addition of a third deck was a small sacrifice in maneuverability for a huge gain in close combat. The additional deck gave the ship an ability to fire onto the decks of smaller two-decker ships, while at the same time protecting its own deck. 1745 The East Indiaman was the largest merchant ship built, it typically could displace in excess of 1,000 tons and measure over 175 feet in length. Those queens of the oceans were the most efficient way of moving men and cargo around the globe. 1760 Life at sea is full of dangers and thus the punishments need to be harsh. If they do not have a sufficient deterrence effect, we will quickly run into trouble. Over time a system of highly public punishments has evolved, and now the time has come to formalize those. This will greatly enhance discipline at sea. 1775 As trade grew, so did the risk. New ways of accumulating capital and managing risk needed to be developed. In Joint Stock Companies the risk of enterprise was shared among their many shareholders. 1790 Originally the midshipman was a rank given to an experienced seaman who worked amidships. Men who aspired to become officers would often choose to serve in this role. If we formalize this, and make it a precondition for acquiring the rank of a commissioned officer, we will ensure our future leaders understand the ships they command. 1805 A further reduction of risk came with the development of insurance. The ability for people to offset risk through payment of a small fee to an insurance broker allowed for further growth of trade. 1820 Building ships that are slightly faster than those of our opponents, even if the amount of this extra speed is so negligible that it is of no military significance, can still fill our crews with confidence and make our enemy wary of taking us on in an even fight. 1835 The ongoing trade deficit between Europe and China has caused a shortage of silver bullions in Europe and all over the world. Switching from silver coinage to gold coinage will allow new coinage to enter circulation and get trade flowing in ever greater amounts. 1350 The citizen soldier, the tribal warrior, essentially the non-professional. The starting point for any military. 1390 The creation of a professional military class is the first step to creation of a modern army. 1420 Charging blindly at the enemy is perhaps not the greatest tactic known to man, but it is one of the simplest to master. It is also the stepping stone to more advanced strategies. 1440 By the end of the middle ages the land armies had become more professional and well organized. Better systems are in place to support the mix of levies and professional soldiers that now dominate the battle fields and the power of infantry is slowly but steadily gaining on the cavalry arm. 1453 Throughout the Middle Ages cavalry's dominance was being challenged by disciplined pikemen. In battles such as Bannockburn or the Golden Spurs, cavalry was defeated by pikes. A combination of improved training and discipline, and the addition of swordsmen to provide close combat support has raised this formation to the peak of its efficiency. 1466 A pike is a remarkably simple weapon to make, but to get the full benefit from the use of pikes, it's required for the whole formation to be wielding weapons of similar length and blade. 1479 Although hand cannons had been developed in China in the 12th century and had spread to Europe by the 14th, the weakness of these weapons reduced their battlefield utility. Light and reliable Arquebus was able to displace bow due to three main factors. It had better armor penetration, it was easier to train men to use it, and it did not rely on the strength of the user. 1492 Artillery had been documented in Europe since the thirteenth century, but due to its lack of mobility, it had very limited battlefield use. The development of the Limber in the 1470s allowed guns to become more mobile and thus useful. 1505 The Arquebus was easy to use as a weapon, but was also inaccurate and slow to fire, leaving its user vulnerable to cavalry charges. Blending with Pikemen allowed Arquebusiers to fire and then fall back to be shielded by Pikemen when enemy cavalry or infantry appeared. 1518 The value of training and experience has always been great on the battlefield. With the advent of gunpowder and the tactical changes associated with it and other infantry weapons came a great demand for units versed in these new innovations. As professional armies were still far away this need had to be filled by mercenary units such as the Condottieri, Swiss Mercenaries or Landsknechts. A growing class of professional mercenary officers came to live of supplying these regiments to needing states in the middle of the military transition. 1531 Pike and shot formations proved a major threat to medieval knights. The initial response was heavier armor to counter the power of gunpowder weapons, but this slowed down cavalry, reducing their shock power. Reiters were usually armed with two pistols and a sword, allowing them to either shoot or charge depending on the opposition they faced. 1557 Spanish Square developed naturally from the Pike and shot formations. At its core was a traditional Pike Square. At each of the corners it had a group of Arquebusiers. It kept the staying power of the traditional pike square and enhanced it with the firepower of the Arquebus. 1570 The new and more mobile artillery had one problem - it could not be easily elevated up and down to adjust its firing range. Trunnions were cylindrical protrusions that acted as mounts for the gun on its carriage, which allowed it to be tilted and thus aimed better. 1583 It was difficult to fire around curved walls, thus once attackers got close enough to the fortification, the ability of other parts of the defenses to provide flanking fire was nullified. The development of star-shaped bastions allowed every part of the wall to be supported from other parts. 1596 The size and depth of the Spanish Square gave it staying power but made it slow and cumbersome to maneuver on the battlefield. It also led to a large percentage of troops being inactive during battles. Maurice of Nassau, the Stadtholder of the Netherlands, reduced the total number of men in the formation to make it more mobile and reduced its depth, so it maintained the same firepower and shock values. 1609 With artillery's growing importance in the battlefield, also the number of firearms kept increasing. But because each gun was made separately, it also required great effort to resupply. In 1544, Emperor Charles V declared that there would be only 5 calibres of gun, while King Henry II of France set 6 standard calibres. 1622 The matchlock firing mechanism's biggest weakness was the need to keep the match lit in order to fire the weapon. Although wheellock was developed, it was too expensive to produce to enter into mass use. The development of flintlock created a more reliable weapon. 1635 The carbine was a shorter form of the musket. 1648 Gustavus Adolphus, King of Sweden, further developed infantry units to improve their firepower. His infantry formations were narrowed and made rectangular to increase the number of muskets that could fire in each volley. Attachment of small artillery pieces further increased the firepower of infantry. 1661 With development of new bastions engineers began to improve the art of positioning them to channel attacking armies into specially prepared killing grounds, where the defenders could inflict maximum amount of casualties on their enemy. 1674 Thanks to bayonets, each musketeer could function as a pikeman as well. This allowed pikes to be removed from infantry equipment and provided infantry formations with more firepower. 1687 In the 1620s the idea of combining the shot and powder into a single unit, a cartridge, allowed for faster reloading and thus firing. This in turn dramatically improved the firepower of guns. 1700 Heavily armored cavalrymen were by their nature cumbersome to form up and vulnerable on the battlefield. Lighter cavalry was added to armies to act as scouts for the army during marching and screen heavier cavalry before its charge on the battlefield. 1715 An outer ditch became a key area for the siege. If attacking troops gained control of the glacis, then the bastions would be lost. The ditch became the first line of defense for a fort. Access to this ditch, and ensuring it kept providing protection to defending troops became a key part of fortification design. 1730 Improvements in metallurgy allowed cannons to become lighter and more reliable. This allowed them to become more effective on the battlefield. 1745 First introduced to the Austrian army as irregular troops from the military frontier during the Seven Years' War, Light Infantry Companies were deployed in loose order and proved to be very effective at harassing enemy and leading assaults on entrenchments. 1760 Although a musket could always be wielded as a club, it was not an effective hand-to-hand weapon. A bayonet was a blade that was fitted to the end of a musket, allowing the weapon to function as a spear. Initial bayonet designs plugged the barrel, making it an either or choice, but the development of the ring bayonet, which fitted around the barrel, turned a musket into a useful support weapon. 1775 Although a cuirass (or a breast plate) had existed for many years, only recently a new style of cavalryman gained popularity, with only a breast and back plate, which provided better balance between protection to the key parts of the body and mobility. 1790 Thanks to the building of several layers of fortification, overrunning of outer bastions simply moved the siege to the next layer, forcing attackers to prepare new locations to site guns and increasing the length of the siege. 1805 The introduction of light infantry troops led to a change in warfare. Skirmishers were deployed forward in loose order to distract and harass the enemy before the main infantry attack, which was typically delivered in either a line or a column. 1820 The musket's weakness was the fact that it was highly inaccurate beyond 50 yards. The rifle, although never a standard infantry weapon, added greater range to elite units, which gave the army a greater overall punch. 1835 Originally developed for siege purposes, the howitzer fired a high angled projectile over the fortifications and into the town inside. The field howitzer, a lighter more mobile variant, would fire an explosive shell above enemy troops. Mixed with other artillery types, it added to the effectiveness of artillery brigades. The following table may contain outdated information that is inaccurate for the current version of the game. The last version it was verified as up to date for was 1.21. ↑ Introduced with patch 1.4 modified with patch 1.6. ↑ See in /Europa Universalis IV/common/defines.lua: TECH_TIME_COST = 0.3, -- tech grow with 20% cost over time. ↑ 7.0 7.1 7.2 See in /Europa Universalis IV/common/defines.lua: IDEA_TO_TECH = -0.02, -- percentage on tech reduction per idea. ↑ See in /Europa Universalis IV/common/defines.lua: TECH_AHEAD_OF_TIME = 0.1, -- per year ahead. This page was last edited on 26 November 2018, at 15:03.